One Galaxy at a time! Live feed from the Exeter Observatory Meteor detectors. A -4.6 mag fireball was detected by the SPAM meteor network at 02.17.35 on the morning of 7th May 2013. Here you can see what a typical meteor strike looks like. The trace starts high in frequency and rapidly drops to the radar carrier frequency as the meteor decelerates in the atmosphere, increasing in strength (ionisation) as it burns up. This creates this typical triangular shape you can see here. The width, height and shape tell us a lot about the strike. The blue is the baseline atmospheric noise. When a meteor strikes Earth’s atmosphere it decelerates rapidly. The friction created by the air causes the meteor to burn up at extremely high temperatures creating the white “shooting star” that we are all familiar with. This process also ionises the air along the trail making it possible to reflect radio waves. 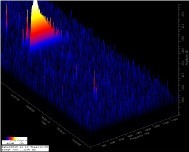 Utilising a high powered VHF radar signal sent into the sky, we are able to detect reflected waves from these ionisation trails. Because the meteor is moving, the reflected signal is shifted in frequency from the original, by an amount according to it’s speed. This shift is also heard as an audible ping by the station operator. Our system translates the reflected wave into three main parameters – Amplitude (strength), Frequency shift (Doppler shift) and decay time. This allows us to determine the relative size of the meteor strike (vertical scale) and the relative approximate speed and deceleration (amount of shift and width of the trace). You can see the output from our system above in real time (approximately 1 minute delay on the Internet). During a meteor shower this trace will be full of strike traces, but it is also surprising how many meteors are striking Earth’s atmosphere all of the time.